After nearly 12 hours on a Spanish train with not one common language spoken among all four fellow passengers cooped up in my couchette cabin, and having just finished a six-month study stint in Madrid, I arrived in Paris in the late 80’s to get re-acquainted with a long-time French friend I met a few years back in college. Great anticipation was running though me as I was eager to venture into a major city touted for its artistic and architectural beauty and for its renowned cuisine. To my mild surprise, the trip was both a revelation and a disappointment. My experiences were marred by an over-priced can of coke ($12) at the Notre Dame (naive tourist like me), an unsatisfying Haute Cuisine salad ($20) that barely sated my appetite (Haute is not that hot! ), and mediocre bistro food at the Latin Quarter that catered to poor students (moi included). The upside of the trip, besides Paris’ sheer beauty, was the discovery of Boulangeries (Delis) in which I would purchase baguette sandwiches filled with tasty cold cuts, patés, and a generous dollop of good grain mustard. Biting into the crusty sandwiches made me wonder if there was French food that was accessible, reasonably priced, and delectable at the same time. Upon returning to Washington DC, I visited the long-time Bistro Francais in Georgetown where I was rewarded a few decent meals, especially 3-course Early Bird Specials that came with a glass of wine for less than $20 ($25 now). I had heard of another local haunt, Au Pied Du Cochon, which was a late nighter in the same area that I never had the chance to visit before its much-publicized demise. Visits to a few high-end area French restaurants only confirmed to me that they can be stuffy, overpriced, and underwhelming. Around a year ago, a regular dining companion of mine told me of a French bistro that opened up in the Alexandria, VA neighborhood near the Eisenhower metro station. He was exclaiming how he enjoyed a simple Mesclun salad with a wonderful Quiche, all for a reasonable price. Such words from a fellow gourmand propelled me to discover it, and many visits have I paid it. From the first visit, Yves Bistro has won my heart and appreciation for good French cuisine. The kitchen’s expertise is evident in their first offering of appetizers. The French Onion Soup is onion-filled, slightly woodsy from the obligatory use of thyme, and topped with a slice of baguette and gratinéed cheese. 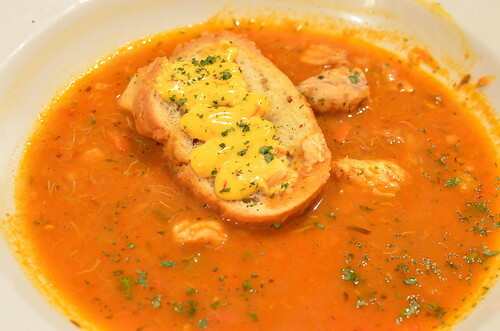 The Fish Soup (Soup de Poisson) is a light fish tomato broth scented with rosemary and dotted with small chunks of moist fish, topped with a slice of baguette drizzled with a rich Rouille sauce. A menu special of Carrot Soup once proofed to be not too successful as it was rather bland and lacking the root sweetness. But the kitchen seems to have the menu standards down pat. The Smoked Salmon, Clams Casino, Mussel stew, and Escargot dishes are fairly good and worth an order. But the true appetizer stars are the Duck Liver Mousse Paté and the Duck Leg Confit. 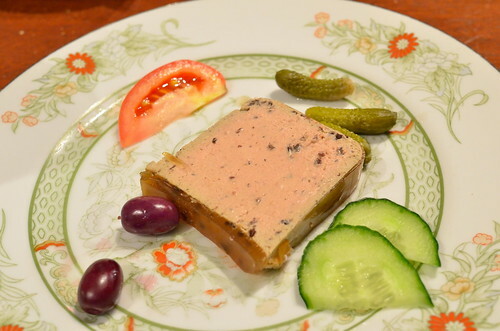 The Paté is rich and fresh, quite heady from generous bits of black truffle studded through it, and complemented by a couple of cornichons and nicoise olives that provide the palate the necessary briny relief from the richness. The lovely presentation on beautiful Lenox chinaware augments the sense of its lusciousness. Although it is listed as an appetizer, I prefer to order the Duck Leg Confit as my main course after not having refrained from the above soups and appetizers. 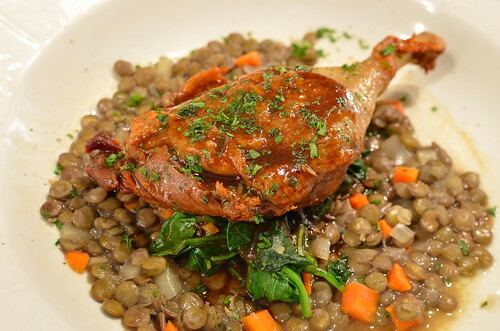 The slightly salty, crispy yet moist duck leg comes perched on some sautéed spinach sitting on a bed of perfectly cooked Puys lentils. This is truly a hearty and satisfying dish with tender pieces of succulent duck well complemented by the vibrant greens and the tender legumes. Sometimes the simplest dish is a good indicator of a light hand and knowledgeable kitchen, as in the case of the Yves Salad. 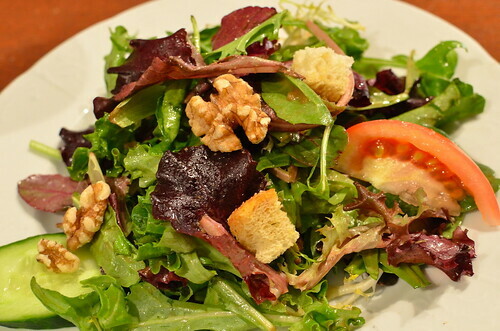 It comprises of baby spinach, arugula, friezé, and red leaf lettuce, that are lightly coated with a good french vinagrette, topped with tasty garlic croutons and roasted walnuts. Simple, tasty, and satisfying – need I say more. There are some shining stars among the main courses, that is if you haven’t stuffed yourself with appetizers yet. The classic Trout Almondine is well handled here with a slight butteriness present on the moist fish and flakey almond slivers. Accompanying it are a veritable Ratatouille and some Alsacian-like sweet sour red cabbage. 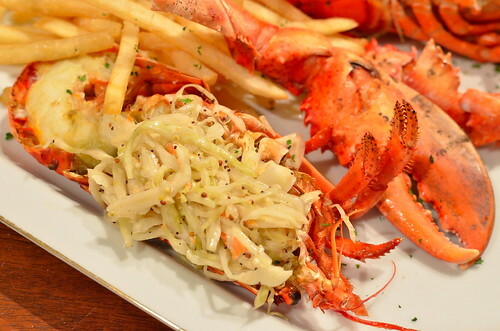 Another seafood fare that is quiet popular and a favorite of mine is the broiled whole Maine lobster that is cooked succulent, topped with a simple slaw, and served with a pile of to-die-for Frites (sans le ketchup to make it fit for any adult). Where can you find large sweet lobsters for around $16? Definitely not in France! The Italian Seafood Stew aka Cioppino is offered regularly and it is over-filling with fresh chunks of mussels, fish, and scallops, swimming in an herbal tomato broth that is worth dunking the accompanying toast in. A lighter fare of different Quiches (Spinach, Mushroom, or Lorraine) is offered with a side of salad. The Sirloin Steak seems popular here (for $18!) and it is high on the next visit list. The combination of Beef Bourguignon on pasta was an awkward pairing for me but it was quite tasty. On most visits, guilt starts to creep in at this point for having sated ourselves with such wonderful, inexpensive, and obviously rather rich food. So, most times, desserts have been totally out of the question. However, on my last visit, we were celebrating a friend’s 35th birthday (his internet age! ), and he had a craving for something decadent. We were advised by our charming manager to get the Apple Raisin Strudel. 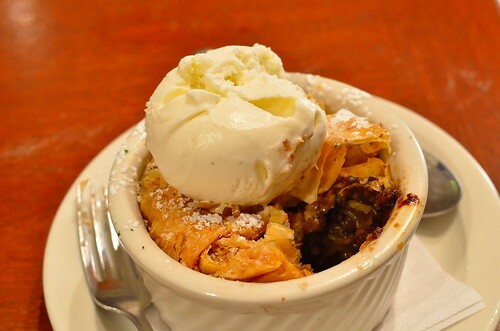 The flakey Phylo top was slightly buttery, and the bottom of the ramekin replete with soft apples, bits of walnut, and slightly tart raisins – a dollop of vanilla ice cream helped to seal the deal. The usual French dessert fare of Poached Pears and Creme Brulée are not amiss here. The atmosphere of the place can be described as charming, relaxed, and warm. Near the kitchen are photos of Yves, the former owner of the now defunct Au Pied Du Cochon, who still makes his rounds from table to table without the gallop of yesteryear but still with his witty charm. Our Mongolian-born manager regales us with her smile, her attentiveness, and an occasional sip of Calvados. And the Syrian-born chef spoils us with his knowledgeable, passionate and skillful cooking that keeps us coming back to revel in what French food is truly about. My dining companions and I wish that this place could remain a hidden secret, but a delightful place like Yves Bistro will soon be a favorite of many French food lovers.